Maneuver a small marble around challenging barriers inside a transparent sphere. Unlike traditional flat-surface mazes that are composed of one path, Perplexus houses various challenging tracks with barriers. Just the right toys for an imagianative 9 year old. A gift his friends raved over! These days solo gaming nearly always comes in the form of handheld electronics. Want to keep the kids busy? There's an app for that. But the truth is, there are remarkably innovative games that don't involve batteries or computers. Perplexus is unlike anything we've ever seen before—and it may just be the most fun you can have without batteries. It's a marble maze that works in 3-D, on every plane, all twisted up inside a ball. Imagine one of those tilting labyrinth marble mazes contorted in on itself, reimagined in color and somehow married with both a playground and a fun house. It's the brainchild of Michael McGinnis, who first came up with the concept in the late 1970s as a project for an art class. Getting it to market was an enormous challenge with lots of ups and downs as Michael tried to navigate the toy industry, but Perplexus was worth the wait. 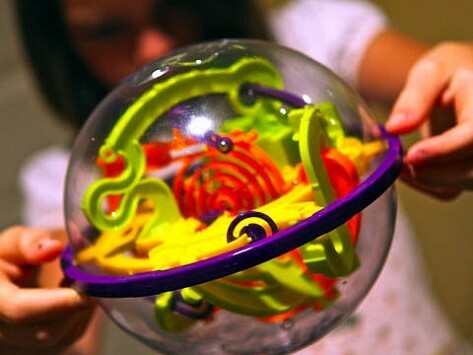 Perplexus challenges the mind, fine motor skills, and hand-eye coordination. In the Original version, which contains more than 23 feet of track inside a 8" diameter sphere, there are 100 separate goal points, divided into three different skill levels. The Rookie version is easier for small hands to manipulate, while the Epic version adds greater complexity and the ability for users to do stunts. Twist is the brand new addition to the Perplexus family, and it requires a player to turn the knob that realigns the tracks to escape traps and decoys. All the models are easy to take in the car, or anywhere else you'll have to keep kids ages 6+ entertained. Just don't be surprised if you find yourself playing with Perplexus just as much as they do!